VW’s newest one-make series is still in its new-born stage, but the publicity campaign for the Volkswagen Polo Cup India 2010 is hotting up with the release of two new shots showing the profile and rear view of the race car. Along with the first publicity photo (above), the full extent of the Volkswagen Design-penned aerodynamic modifications can now be seen. The ground-hugging body kit, lowered ride height and wider tracks make the car appear tougher and ready for India’s motorsport circuits. 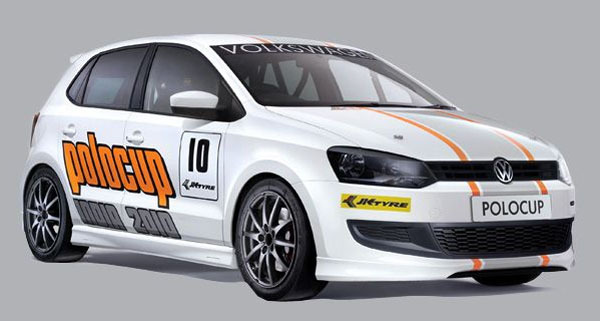 The Volkswagen Polo Cup India 2010 will be run by Volkswagen India Motorsport in conjunction with JK Tyres and the 129bhp 1.6-litre TDI racers take to the track for the first race on 30 May. So far this week there seems to be a motorsport theme developing on PoloDriver. Yesterday we posted news about the Volkswagen Polo Cup India and today we have something very special to report on. Taking internet forums by storm is the innocent-looking AME Racing Polo with 1047bhp. Yes, that’s right. A Series 1 Polo with more power than a Bugatti Veyron. It is, quite literally, a pocket rocket, and it’s brought out the boy racer in us. It’s set all sort of class best times at Volkswagen and drag racing events in Germany and blitzed, no, annihilated the competition. Just look the videos in this post; it leaves everything for dead and shoots off at such a speed it’s almost cartoon fast. If not cartoon fast, then definitely with performance even more scorching than Disney’s modified Herbie stunt cars. But what makes it go so quickly? The basic Series 1 Polo bodyshell has had a 1.9-litre turbocharged 16V engine shoehorned into the small engine bay (a debate rages as to whether it’s actually a V6), mated to a four-wheel drive transmission from an Audi TT. AME’s drag star can rev to 9400rpm, do the standing quarter mile in 9.5 seconds, get to 62mph in 2.3 seconds (with 125mph coming up four seconds later) and has a top speed of 160mph and 950Nm of torque. It’s the stuff of legend. Getting the power down is clearly and occasionally a problem. The car visibly bucks and jumps and you’ve only got to look at the size of the madly large tyres to see what’s needed to try to get maximum traction. The AME Polo runs on 15-inch alloys with M+H slicks or 16-inch rims with 205/55 16 boots stuffed under the tiny arches. The engine has far too many mods to list here; visit AME’s page on the car to find out exactly what’s been done. Volkswagen’s engineers never expected the Seventies Polo to go like this; the highest-powered factory-approved model was the 59bhp 1272cc Polo GT of 1979. The AME super-Polo has 988bhp more and although it’s got around 300kg more (980kg with driver) to lug around, the performance is simply off the scale. The world’s fastest Polo? We wouldn’t bet against it. Watch all the videos linked from these and be amazed. Not only has Volkswagen revealed the Indian market new Polo at the Auto Expo in New Delhi today, it also, more excitingly, announced plans for the Volkswagen Polo Cup India 2010, a one-make racing championship. It will be the world debut for the new Polo as a racing variant once the season gets underway on 30 May. Volkswagen report that only a few days after the production car makes its debut in New Delhi, the racing version will turn a wheel in anger, so we think it’s fair to expect some action in the next few days. The new Polo racer is powered by a 1.6-litre TDI engine, developing 129bhp and linked to a six-speed manual gearbox. Adjustable race suspension also features, along with 17-inch multi-spoke alloy wheels and 200/60 section slick tyres. Distancing itself from the showroom model, the circuit Polo has an aerodynamic body kit, consisting of redefined rear bodywork with a distinctive ‘deflector vane’ and special wind tunnel-developed front, rear and side skirts. An uprated exhaust system emphasises the sporty looks, producing a more angry sound. Design work for the new Polo Cup car was carried out by Volkswagen Design in Braunschweig, so it should be a proper piece of racing kit. ‘The new road-going Polo’s attractive design makes it a veritable eye-catcher. Apart from the demands which motorsport makes on a car, this was a major development objective for the new racing version as well,’ explains Volkswagen Motorsport Director Kris Nissen. ‘At Volkswagen, production development and motorsport work hand in hand, parallel to the presentation of the road car.’ In the cockpit, a Volkswagen sports-style steering wheel and a new shift gate add to the interior’s sporty appeal. 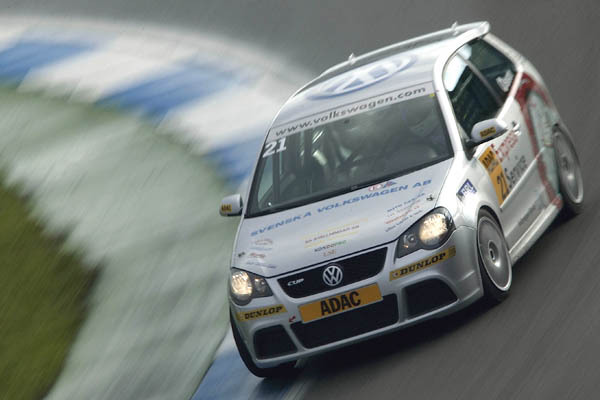 Just like the German ADAC Volkswagen Polo Cup series which ran from 2004 to 2009 (above), the Volkswagen Polo Cup India will nurture fledging racing talent. Twenty drivers aged 16 to 24 will be plucked from driving camps all over India and the series could be a launch pad into a professional touring car career. And, just like the German series, all 20 cars will be built centrally by motorsport engineers at Volkswagen (this time at the Pune factory) and feature professional data logging and analysis. 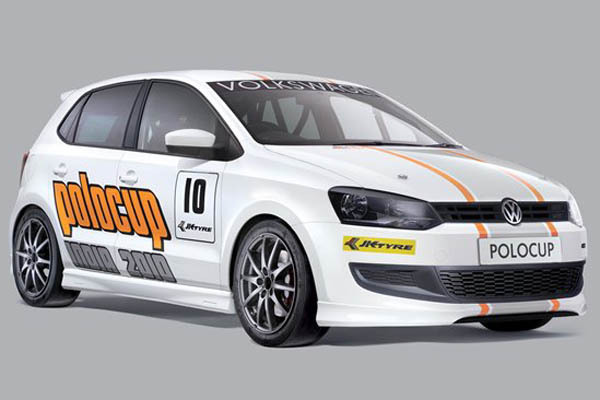 The Volkswagen Polo Cup India 2010 will be run by Volkswagen India Motorsport in conjunction with JK Tyres. We’ll bring you more details of this exciting new chapter in the Polo’s motorsport career as we get them.